Ed Yost was nothing short of a creative genius when it came to changing and modifying mechanical things to fulfill his needs. And so it was, that when it came time to make changes to his own action design, he didn't hesitate. It didn't take Ed long to want to use one of his own actions to build a .22 rimfire cal. Schuetzen rifle. One of the first things that became apparent with this project was the difficulty of chambering the small .22 long rifle cartridge and the removing the spent case after firing. Although a small "loading / unloading" tool was first considered for these tasks, Ed chose instead to make a radical change to the right side wall of his action. The Yost action side walls are similar to the side walls found on the Winchester "High-Wall". What Ed did, was to "lower" the right side wall making it similar to the side wall found on a Winchester "Low-Wall". Ed was right handed, otherwise the left wall of the action can be likewise modified for left handed shooters. With this modification. what Ed now had could be called the Yost "High-Low-Wall" action. This change however, was not totally new. 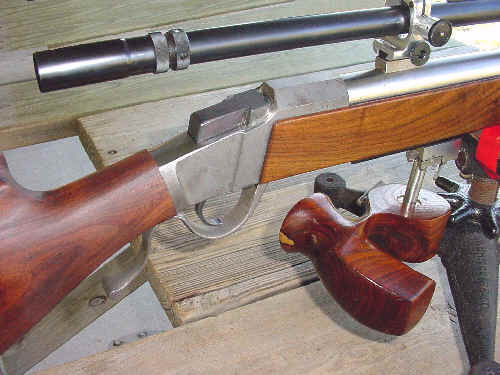 Harry M. Pope did a similar face-lift on an original Winchester High-Wall which he re-barreled to .22 rimfire. What goes around, comes around. Right side wall of the Yost action has been cut-down to give easier access for loading and unloading the small 22 long rifle cartridge. Strength is not an issue because 22 long rifle cartridge is relatively low pressure. The sleek lines of the Yost action are not compromised with this modification. In addition to the optional action modification, provision must be made to fire the rimfire cartridge. The following modifications which are shown are but one of many ways to build up a Yost rimfire rifle. First to be shown below is the modification of the striker pin and striker pin bushing. In this method, the striker's pin was modified from center fire ... to rimfire. The striker's pin was relocated to the right side of the cartridge rim. (as viewed from the rear) This location is opposite the extractor. 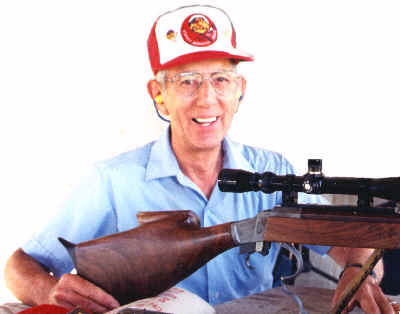 This is the method Ed Yost used on his own 22 rimfire rifle. 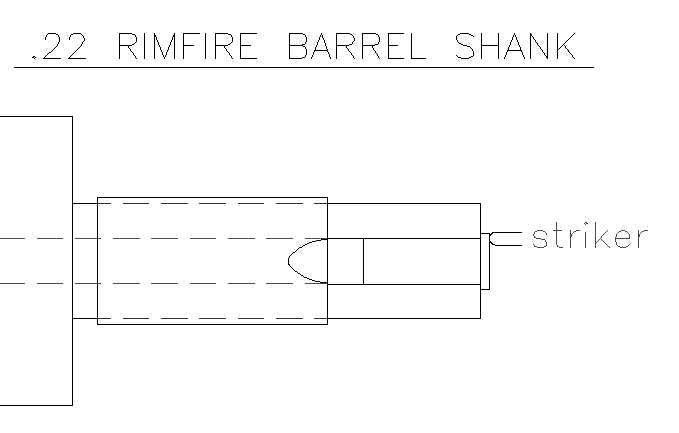 Additional: The "Striker-pin bushing" (which screws into the breechblock face) must be replaced with a newly made "rimfire" version, or it must be modified with the addition of a second hole for the rimfire pin. The striker bushing in the breechblock is made removable for is easy replacement if required. The Striker Bushing can be easily machined or modified by any competent gunsmith of machinist. 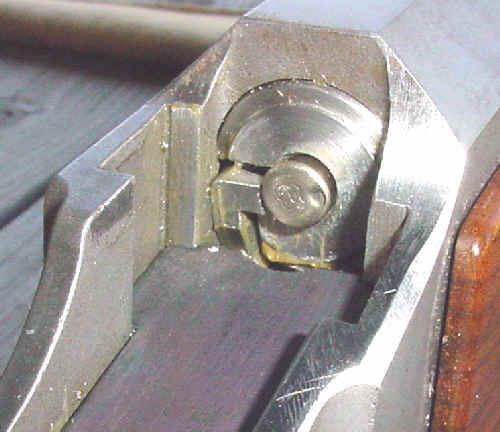 If the breechblock is modified with a striker bushing having 2 holes, it would be possible to modify the striker with a "changeable" pin in order to switch back-and-forth between rimfire and centerfire. 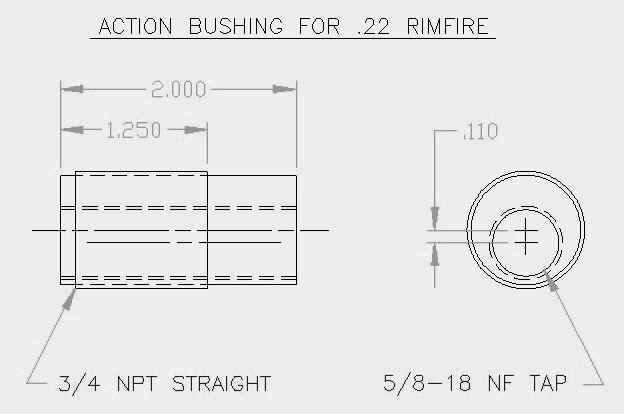 This second rimfire modification option does not modify the striker pin or striker pin bushing. Rather, it utilizes a separate "off-set barrel" bushing that fits the threads of the Yost action. 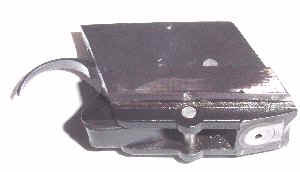 This type pf modification is recommended for building "Switch-Barrel" rifles. An action bushing for .22 rimfire conversion is made to thread into the Yost action. A smaller, 5/8-18 NF tapped hole is offset downward .110 inches in the vertical plane. The bushing must be "dialed" into the action within +/- .001 of vertical. A penetrating "blue" (removable) loc-tite is used to temporarily secure the bushing in place. The .22 cal barrel shank is threaded and screwed into the off-set bushing. In this position, the striker will hit exactly at the 12:00 position on the top edge of the .22 cal rimfire cartridge. Once satisfied that barrel is properly fitted in the desired position, it is permanently secured into the action bushing using "red" (permanent) loc-tite. 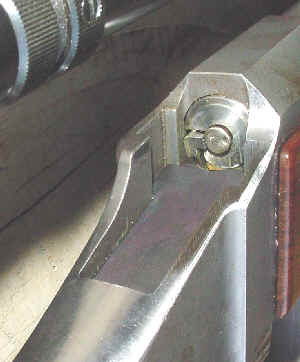 When next the barrel is desired to be removed, the bushing will remain attached to the barrel and thread free of the action. Remove traces of the "blue" temporary loc-tite from the outer bushing threads prior to re-installing it into the action. 22 cal Yost Schuetzen Rifle with 20x Unertl Target Scope.